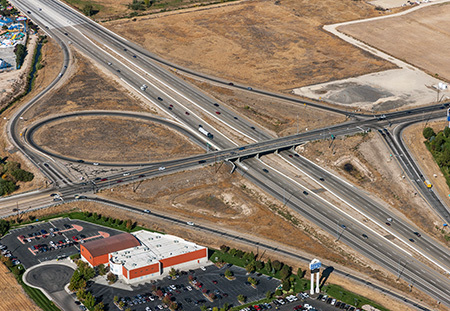 GeoEngineers is part of the consultant team recently awarded design of the Interstate 84 (I-84) Meridian Road Interchange project in southwestern Idaho. This major transportation corridor runs through the Treasure Valley, Idaho’s business and population center, and is anchored by Nampa to the west and Boise to the east, with Meridian located halfway in between the two cities. In making the award, the Idaho Transportation Department (ITD) selection committee cited the quality of work by the team—Parametrix (prime), HNTB, T-O Engineers and GeoEngineers—on the Idaho 16 (SH-16) extension project, a high-profile, fast-track project now under construction about seven miles northwest of the I-84 Interchange site. In recent years, ITD completed a series of GARVEE (Grant Anticipation Revenue Vehicle)-funded road-widening and overpass projects along the I-84 corridor, but the 47-year-old overpass at Meridian Road remained a bottleneck where motorists had to squeeze from eight lanes of traffic down to six. Area residents’ desires to improve pedestrian and bicycle safety also helped make this project a priority. The new Meridian interchange will serve through-traffic and the new on- and off-ramps will serve motorists traveling between the fast-growing communities of Meridian, Kuna, Eagle and Star. The existing overpass at Meridian Road/I-84 narrows to two lanes each way, creating a traffic bottleneck.